NMEA 2000 is a combined electrical and data specification for a marine data network for communication between marine electronic devices such as depth finders, nautical chart plotters, navigation instruments, engines, tank level sensors, and GPS receivers. 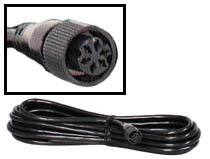 It has been defined by, and is controlled by, the US based National Marine Electronics Association (NMEA). NMEA 2000 connects devices using Controller Area Network (CAN) technology originally developed for the auto industry. NMEA 2000 is based on the SAE J1939 high-level protocol, but defines its own messages. NMEA 2000 devices and J1939 devices can be made to co-exist on the same physical network. NMEA 2000 (IEC 61162-3) can be considered a successor to the NMEA 0183 (IEC 61162-1) serial data bus standard. It has a significantly higher data rate (250k bits/second vs. 4800 bits/second for NMEA 0183). It uses a compact binary message format as opposed to the ASCII serial communications protocol used by NMEA 0183. Another improvement is that NMEA 2000 supports a disciplined multiple-talker, multiple-listener data network whereas NMEA 0183 requires a single-talker, multiple- listener (simplex) serial communications protocol. One of the leading manufacturers of marine-equipment, Raymarine, uses SeaTalk 2 which is highly compatible with NMEA 2000.